What is Sarajevo Model UN? Sarajevo Model UN represents an academic simulation of various multilateral bodies and agencies such as the United Nations Security Council, European Council. The first edition of Sarajevo Model UN was held in 2016, in partnership with the United Nations in BiH. The first conference attracted over 80 participants from more than 15 countries and coming from 3 continents of the globe. Aside from academic simulations of four multilateral councils (UNSC, WHO, EC and GCC), our participants had an opportunity to engage in round tables with prominent members of the academia, representatives of the UN in BiH and members of the diplomatic corps to Bosnia and Herzegovina. Last year, the Conference simulated the following councils: the United Nations Security Council, United Nations Women, European Council, and the North Atlantic Council. and hosted over 85 delegates, coming from more than 4 continents of the globe. What is the Main Aim of this Conference? The main aim of the Conference is to build foundations to catalyze interaction, and enable a vertical exchange of information and knowledge between stakeholders, policy-makers, NGOs and members of the academia on one side, and prospective young individuals and aspiring diplomats from the region. The aforementioned, will help both policy-makers and participants to develop answers to some of the current issues in the domain of multilateral diplomacy. Hence, Sarajevo Model UN is a platform for participants to experience first-hand what it means to be a diplomat working and presenting at the world’s most influential multilateral institutions. Our conference offers a new experience for participants with a passion for EU, regional and international affairs, international law, PR, lobbying and journalism. By promoting diplomacy through formal council debates, and through a series of academic round-tables, our Conference will, indubitably, educate participants; as well as inspire a new generation of diplomats, attorneys, young professionals and journalists. What is the Overall Objective of this Conference? The overall objective of this project is to stimulate young people in active participation in democratic processes in their societies through academic training and simulation. This project includes multiple platforms at which participants will discuss global socio-economic problems, conducted solely, in English language. Conference participants will have the opportunity to represent foreign states, which to a great extent, contributes to the development of research capabilities, critical analysis, public speaking, teamwork and leadership skills. In addition to that, one of the goals of this conference is promote academic development of the youth in Bosnia and Herzegovina and offer them a gateway to the global contemporary academic movement. Additionally, our participants will become active participants in creating sustainable socio-economic solutions to some of the global and regional issues. What Councils will be Simulated at Sarajevo Model UN 2018? 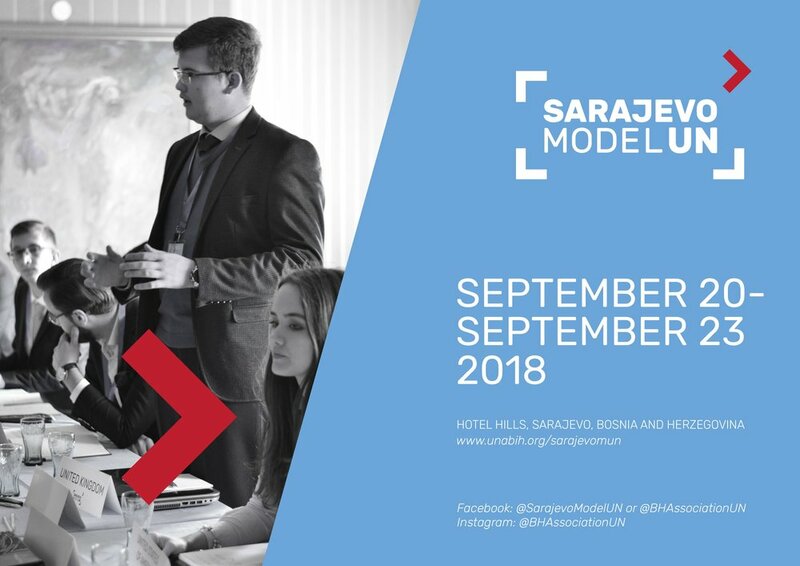 In partnership with various relevant institutions, private sector and hotel Hills, we are looking forward to host 100 future diplomats and Agents for Change for the Sarajevo Model UN 2018 edition. Why should I Participate at this Conference? Because you will have a unique opportunity to interact with other Agents for Change from all over the globe, learn from leading experts, research on most pressing prevalent issues of the contemporary global affairs, develop your soft skills, negotiate in simulations -- and most importantly, have fun! Join the movement of shaping future diplomats, apply for Sarajevo Model UN 2018! it is my great pleasure to welcome you all on behalf of Sarajevo Model United Nation’s Secretariat. This conference will take place from September 20-23 at Hotel Hills in Sarajevo and will bring you the opportunity of experiencing diplomacy and international affairs at first hand, playing the role of a United Nations Member State representative in any of our four committees (UNSC, UNHRC, UN WOMEN, GAC). Sarajevo Model UN offers an international atmosphere that gathers very different individuals to share their passion for international affairs and their aim of being the change that our future world needs. In an incredibly complex and volatile world where globalism confronts nationalism, where peace is threatened by numerous political conflicts and values seem to disappear, the role of the youth is more important than ever: today’s students will be tomorrow’s leaders. This Model UN will bring you the opportunity of learning interpersonal skills such as lobbying and negotiation, expressing and defending your ideas in a diplomatic manners and, the most important, the empathy you need to put yourself in others’ shoes. Hence, I do believe that our participation in Model United Nations contributes to make us different, to open our minds and it will help us to modify the history our generation. A new generation is a change needed in the fragile world’s contemporary order and for this reason, we have decided to hold this year’s session under a common theme: the importance of youth and the promotion of their leadership through international conferences. Therefore, if you are a curious, open-minded individual, eager to learn, to interchange ideas and, moreover, you aspire to be the change the international community needs, rather than a mere observer, Sarajevo Model UN is your place to be. The path is taken, the decision of which side to take is yours. Our conference is a place of vertical exchange of knowledge and ideas between accomplished and experienced members of the academia, acting on the world stage and perspective youth interested in gaining further insight in the sphere of international relations and diplomacy. We envision Sarajevo Model UN as a place to meet, discuss and experience first-hand, what it means to be a diplomat working or presenting at the world’s biggest multilateral organization- the United Nations. The Organizing Board is responsible for organizing logistical, financial and human capital aspect of the Sarajevo Model UN conferences. The Organizing Board, conceptualizes, secures funding and acquires logistics, all in order to provide the best experience for conference participants. This team is the backbone of every successful conference/project. For inquiries related to Sarajevo Model UN conference, please contact the Organizing Board via email: secretariat@sarajevomun.com.